If you're wondering about how to cook jasmine rice, particularly whether cooking jasmine rice is in any way different than cooking any other type of rice, the good news is, it isn't! Rice is rice, and whether it's white or brown, you cook it all the same way—brown rice takes a little longer, that's all. Below you'll see the steps for how to cook jasmine rice, specifically white jasmine rice, the distinction being how long it takes to cook it. But again, the steps below will work for any white rice. Obviously, you can go ahead and skip ahead to the steps if all you want to know is how to cook it. But for the rice aficionados out there, along with others who are deeply curious (you know who you are), we're going to offer you some additional information about jasmine rice, like where it's from and that sort of thing. Jasmine rice is an aromatic, long-grained rice grown in Southeast Asia, meaning Thailand, Laos, Cambodia and Vietnam. Its aroma is a complex blend of popcorn, nutty, and floral (although it doesn't smell of jasmine; it's named because its white color resembles the white of jasmine blossoms). Its flavor and aroma are similar to basmati rice, though jasmine is slightly nuttier. 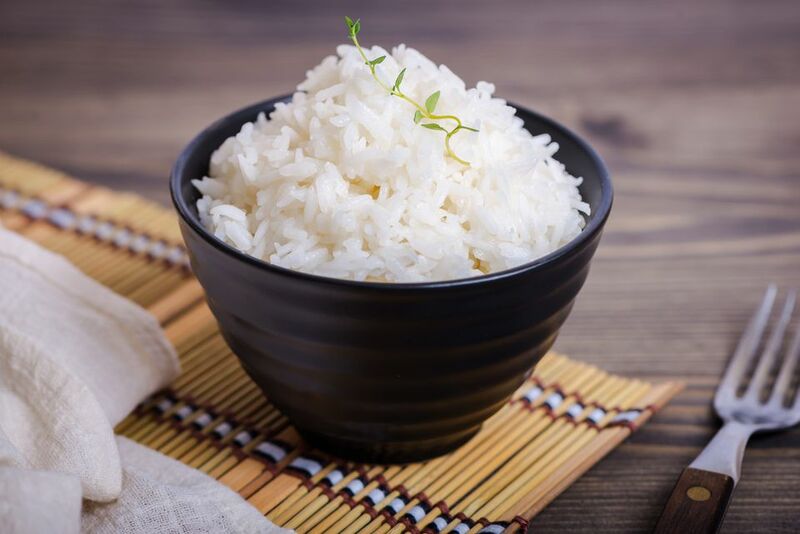 Additionally, jasmine rice is noticeably more starchy than basmati, which makes it ideal for eating with chopsticks as the additional starch helps it to stick together when cooked. Like all rice, jasmine rice is available in both white (which is most common) and brown. And like all brown rice, brown jasmine rice is simply jasmine rice that still has its outer layer of bran on each grain. Thus in addition to containing additional fiber, protein and fat, brown jasmine rice also features a nuttier flavor and aroma. Cooking brown jasmine rice takes about twice as long as white jasmine (although the amount of water shouldn't change). Here's more about cooking brown rice. Rinse the rice once with cold water. Then use your fingers to gently massage the rice. Drain the water and shake off any excess water from the rice. Place the rice in a pot. If you are cooking 1 cup of rice then add 1 ½ cup water to the pot and bring it to boil. Once the water is boiling, turn the heat down to the lowest setting. Cover and simmer until the rice is cooked through. This will take about 20 minutes. Remove the rice from the heat and allow to sit, still covered, for at least 10 minutes. Fluff the finished rice with chopsticks or a fork. Serve and enjoy with your favorite entrees! Rice can be stored in a sealed container in the refrigerator for 5 to 7 days. It also freezes well. Place leftover rice in a zip top bag and freeze the rice. You can defrost it or put it frozen into a soup or stew. Leftover rice is so versatile, you should never throw it away. By simply adding some lime juice and lime zest, you'll brighten up leftover rice. Or use it to make something else like fried rice, rice pudding, rice and beans, or as a side dish for any main meal. Because it's so starchy, jasmine rice might be a second-best option for making pilaf, with basmati being a better choice. Which is not to say that jasmine rice can't be cooked via the pilaf method. It can! The pilaf method encourages the grains of rice to cook up separately rather than sticking together. This is both a feature and a bug. After all, the starchiness of jasmine rice is one of its desirable qualities, so if a pilaf is what you crave, you won't be maximizing the full potential of your jasmine rice. But life is short, so cook your rice the way you like it. As noted earlier, all rice can be cooked the same ways. In case you're wondering about soaking: Don't soak your rice! That goes for jasmine or any other type of rice you might be cooking. It's not entirely clear where the notion of soaking rice originated, but it does explain the pervasiveness of soggy, muggy rice. It also helps explain the prevailing notion that cooking rice is a major undertaking. Cooking white rice should take 20 minutes from start to finish. Brown rice is closer to 40. Either way, tacking on an hour (or heaven forbid, TWO) of soaking time will needlessly transform a quick task into one that is prohibitively time-consuming. Rinsing is another matter. Rinsing your rice before you cook it will wash away some of the starch on the outside of the grains. Depending on how thoroughly you wash, this will definitely cause the rice to stick together less. Now, whether this is something you want or not is another matter. If you're cooking jasmine rice because you enjoy the way it tastes at your neighborhood Thai or Vietnamese restaurant, you might not want to rinse it. If your objective with rinsing is to remove dust or other impurities, rinse it very quickly, but not so long that the water runs clear.